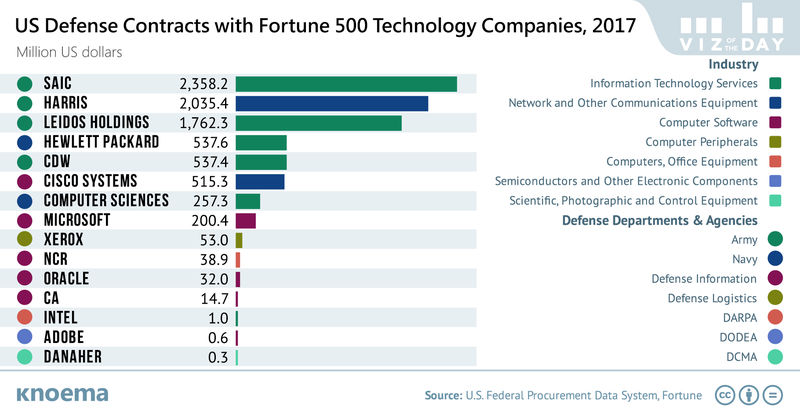 US tech companies are keeping lucrative US Department of Defense (DoD) contracts in their sights as indicated by growing attendance at DoD events. This is unsurprising given the rapid growth of AI technology—which the DoD wants to use in predictive maintenance, process automation, and humanitarian assistance—and the DoD’s long-maintained reliance on private contractors. According to the US Federal Procurement Data System, in 2017, DoD obligated $321 billion to contractors, which is more than all other government agencies combined. Contract obligations of the department account for 43 percent of total national defense expenditures and 7 percent of total federal government expenditures, according to the US Bureau of Economic Analysis. Tech company employees are less enthusiastic about participating in the development of military tech, rejecting the idea that these contracts help to make the world a better place. Statements and actions by corporate execs, however, show companies are less willing than their employees to walk away from DoD. Microsoft's CEO defended the company’s military contract, arguing that Microsoft technologies help to protect freedoms. The assertion is not surprising given Microsoft's history contracting with the US military. According to the Federal Procurement Data System-Next Generation, which tracks US federal funds obligated on contracts, Microsoft was the seventh largest contractor of the Defense Information Systems Agency (DISA) in 2017; DISA in turn maintains the third highest contract value among defense agencies. Apparently Google employees take a similar view to peers at Microsoft and were more successful. Last year, employees protested the company's contract with the US Pentagon to apply AI to identify potential drone targets from satellite images and Google dropped the contract.